Remove shells from hard boiled eggs. Slice eggs in half lengthwise and remove yolks. Place yolks in a medium mixing bowl and set aside. In two separate bowls pour 2 cups of hot water and 1 teaspoon of vinegar. Stir a few drops of red food coloring in one bowl and a few drops of blue in the other until you reach the desired color. Carefully place half of the sliced eggs in the red bowl and the other half in the blue bowl. Let sit for 5 minutes to absorb color. Remove with a slotted spoon onto paper towels to dry. For the filling, add the mayonnaise, relish, dry mustard and salt to the egg yolks. Blend with a hand mixer until smooth. 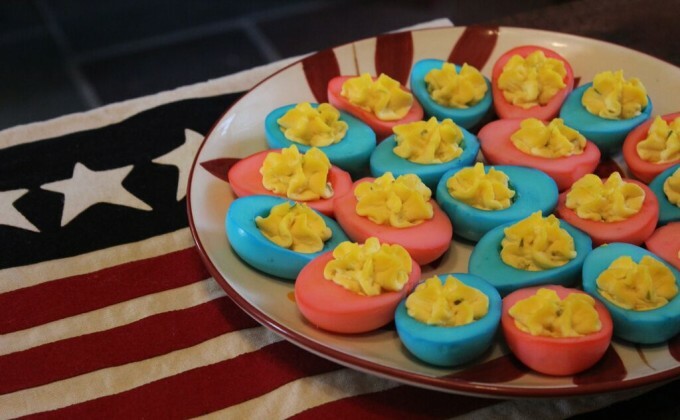 Lay your dyed eggs on a temp-tations® egg platter. Pipe or spoon filling into each one. Sprinkle with paprika if desired.